How to comply with the Data Privacy GDPR law from the European Union? Do you need GDPR Document Templates with everything you need to become compliant? Download these GDPR Templates as 1 kit and avoid using expensive consultants to get the job done. The EU General Data Protection Regulation (GDPR) is enforced since 25 May 2018. We're here to help you become compliant. The GDPR comes with a set of Rules and Regulations for the protection of personal data inside and outside the European Union (EU) and affects all companies that save personal data from European citizens. We provide a complete set of templates with GDPR documents in order to become compliant with the European Union GDPR regulations. After you understand the impact GDPR might have on your company procedures, you need to make a plan to start with a GDPR Readiness assessment. If you can compare IST and SOLL situation, you can be sure what to do. Based on that you can make a GDPR preparation plan. This is a structured approach to start implementing the GDPR templates. For example for the following activities which require specific GDPR templates. This GDPR Template Kit has the document templates you need and they are provided in Microsoft Office formats, and easy to customize to your organization’s specific needs. Often completed example documents are also provided in order to help you with your implementation in order to save precious time. 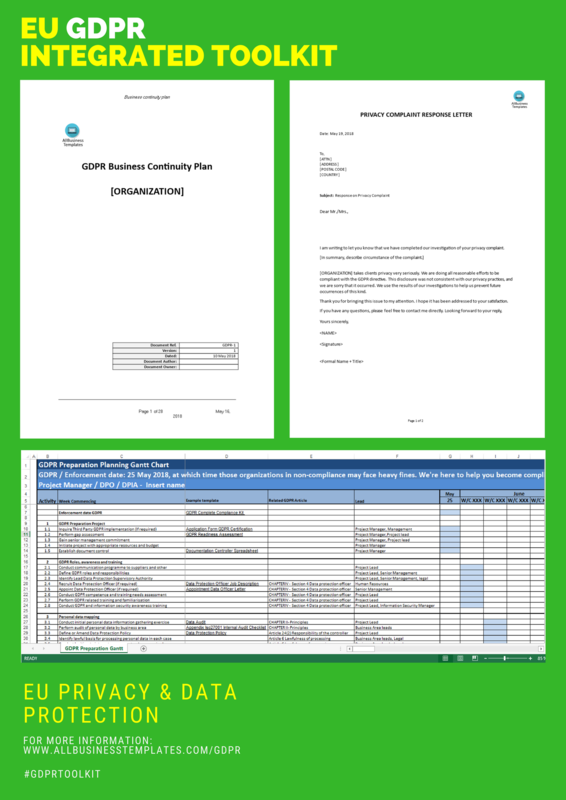 Download this GDPR Complete Template Kit now or check out individual fit-for-purpose GDPR Compliance templates here! The document templates will be available to download immediately after purchase. We also provide a pragmatic GDPR Preparation Planning Gantt Chart in order to help you plan your individual project.